This year’s Oscars swung the pendulum from strangely apolitical to peddled propaganda. Well, it was a weird, weird Oscars. 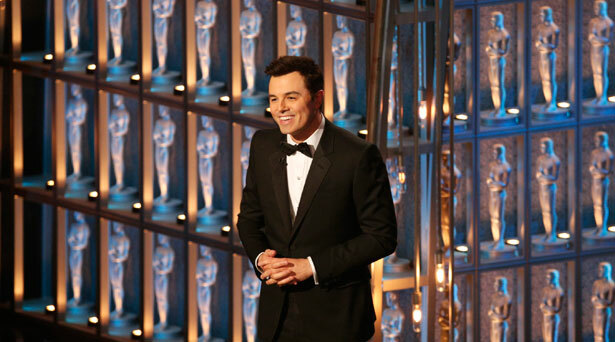 Seth MacFarlane hosted the awards ceremony, so as expected there was a deluge of sexist, racist and homophobic jokes, some (most?) of which fell painfully flat. Also as expected, the ceremony dragged on for an eternity in a parade of self-congratulatory dribble about how the Academy is really concerned about encouraging diversity—look! they recruited youngins from the outside world to carry the awards!—while the Academy remains nearly 94 percent white and 77 percent male, and nearly all the films nominated were made by white men, starring white casts. For a community that prides itself on being edgy liberal outsiders ahead of the curve when it comes to social justice—remember George Clooney’s unbearably smug acceptance speech that credited Hollywood for every single meaningful social gain from the civil rights movement to LGBT rights?—this year’s Oscars swung the pendulum from strangely apolitical to the polar opposite when it peddled propaganda. There was no mention of any kind of armed conflict. Nothing. No mention of uprisings or wars, no mention of drone strikes. The room had a strange numb quality to it. There was no 2003 Michael Moore moment when the director was practically booed off stage for criticizing President Bush and the Iraq invasion. Actually, this year, there was no mention of politics of any kind, except when the first lady bizarrely showed up surrounded by military service personnel in dress uniform. She declared of the Best Picture nominees, “They reminded us that we can overcome any obstacle if we dig deep enough and fight hard enough and find the courage within ourselves.” Of course, the nominees included Zero Dark Thirty and Argo, two propaganda films widely criticized for manipulating true events, and in the case of the former, outright lying by suggesting torture led to the capture of Osama bin Laden. Having the first lady—and by extension, the White House—present an award to a pool that included propaganda films was, at best, creepy. Meanwhile, those who did win awards raved about the collective effort of filmmaking, but there was almost no mention that hundreds of technicians who worked on the film Life of Pi were protesting the ceremony. As the stars walked the red carpet, several hundred people congregated outside the Dolby theater in Los Angeles demanding better treatment of workers. When the visual effects team behind Life of Pi attempted to draw attention to Rhythm & Hues’s plight during their acceptance speech, they were cut off by the band as the speech had exceeded the stipulated time limit. VFX artist Dickie Payne, whose work includes Titanic and Seaquest DSV, was particularly scathing. It isn’t as though VFX employees in Los Angeles can easily relocate, he said. In addition to the problem of uprooting from a community when you have children and other ties, there are immigration restrictions. It’s all rather par for the course that the Oscars is a white-centric, Western-oriented affair, but this year felt even further removed from the reality facing millions of individuals every day. Artists are supposed to force people from their comfort zones and make them confront sometimes painful truths. Some films (5 Broken Cameras, How to Survive a Plague, to name a few) did that and were nominated for their efforts, though they didn’t win. Banality and jingoism were rewarded this year, as were sexism and racism. I mean, even the marketing this year was stupid. An Academy Awards for men? As opposed to what? With a 77 percent male Academy membership, every year is a men’s Oscars. Read Roane Carey’s take on two Oscar-nominated films that shed light on Israel and Palestine.